We roll into the 1970s in our flashback countdown with another state visit exchange from Queen Juliana of the Netherlands. In April 1972, the Dutch sovereign and her husband, Prince Bernhard, arrived in the United Kingdom to visit The Queen and The Duke of Edinburgh. Jaunty hats still reigned at this time - I wouldn't mind seeing this one dug out and handed over to the granddaughters, actually - and those of you that despair the few pairs of shoes Her Maj wears today will note the change here. I'm primarily noting the daytime appearance of the Scroll Cambridge Emerald Brooch, the fancier of the Cambridge emerald brooches and the one usually used for on a sash for evening events. A Windsor Castle state banquet headlined the trip. 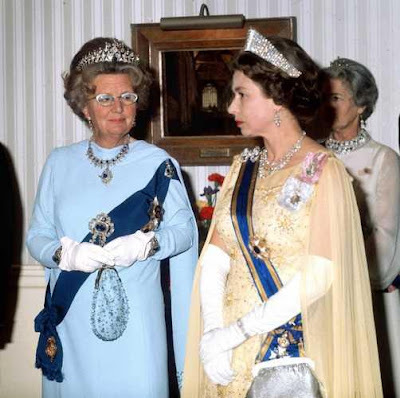 Naturally, Queen Juliana again emphasized her biggest jewel with a British connection, the Stuart Tiara, the massive size of the tiara dwarfed only by the massive size of her hair. QEII also made a repeat of her appearance at the state banquet Juliana hosted for her when she visited the Netherlands in 1958, wearing the Grand Duchess Vladimir Tiara, the Duchess of Gloucester's Pendant Earrings, Queen Victoria's Golden Jubilee Necklace, her Royal Family Orders, and the Order of the Netherlands Lion. She did swap in the True Lover's Knot Brooch, which she also brought with her for that previous Dutch state visit. The Duke of Edinburgh is wearing the "Windsor uniform", which dates in some form all the way back to 1779 and includes a tailcoat with distinctive red collar and cuffs. He's wearing knee breeches here, which allow him to wear the actual Garter of the Order of the Garter at the knee, as men are intended to wear it. 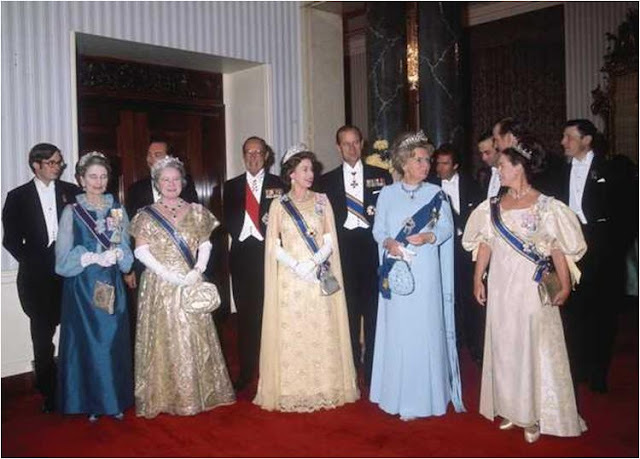 Queen Juliana, highlighting her true blue Order of the Garter with the impressive Dutch Sapphire Parure (including the necklace which is now used as a tiara), hosted a return banquet at the Carpenter's Hall. The Queen wore Queen Alexandra's Kokoshnik Tiara and the George VI Festoon Necklace, another combination she wore to her previous Dutch visit, but she's already knocking back the sparkle by using the smaller Antique Girandole Earrings and Dorset Bow Brooch this time around. She led a large family contingent at the banquet, a sight far more common in those days, featuring The Duchess of Gloucester (Princess Alice) in her Teck Turquoise Parure and Queen Elizabeth The Queen Mother in the Greville Tiara. The Queen Mother also wore another impressive piece from the Greville Bequest, the emerald and diamond necklace (a piece we have yet to cover). And Princess Margaret wore the Lotus Flower Tiara and the diamond collet necklace she inherited from Queen Mary that was sold after her death.